We own a 2007 2350 originally equipped with 9 interior twin-tube florescent light fixtures. We never liked the ice-blue ambiance they provided, and they resonate or flicker when the batteries are less than perfect. I wanted to convert the fixtures to warm emitting LED technology to improve the ambiance and to reduce battery power consumption. I decided to convert the fixtures rather than replacing them to avoid imprints on the ceiling and also some holes left behind. I also wanted to convert to LED without spending a lot of money. Here are the details. - Total investment to convert all 9 fixtures was around $32 or about $3.50 per fixture. - The original florescent fixtures used 9 watts of power. My conversions of two different light intensities reduced power consumption by 55% & 66%. 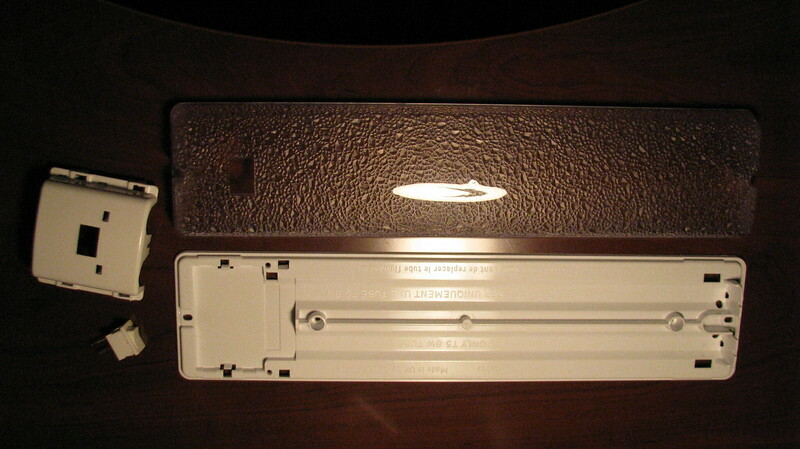 - The cost included an LED mood light into each of the 9 fixtures which are rated at less than 1/3 of a watt. If I did not add a mood light into each of the 9 fixtures, the project would have been much faster and easier and cost only $12 total, or $1.33 per fixture. This because I would need fewer LEDs and also reuse my original white 2-way switches. I bought two 5 meter long reels of self-stick LED strips on ebay HERE for around $12 per reel at the time. I selected the "Warm White" LED option. 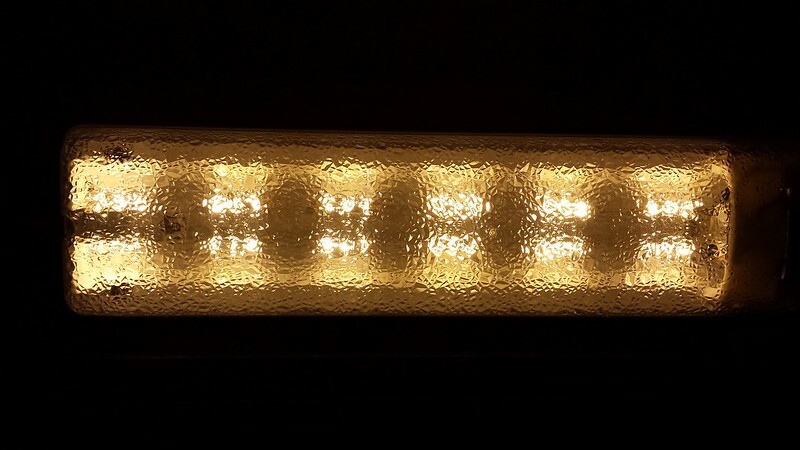 The LEDs are grouped in 3's with a shared resistor to power them. 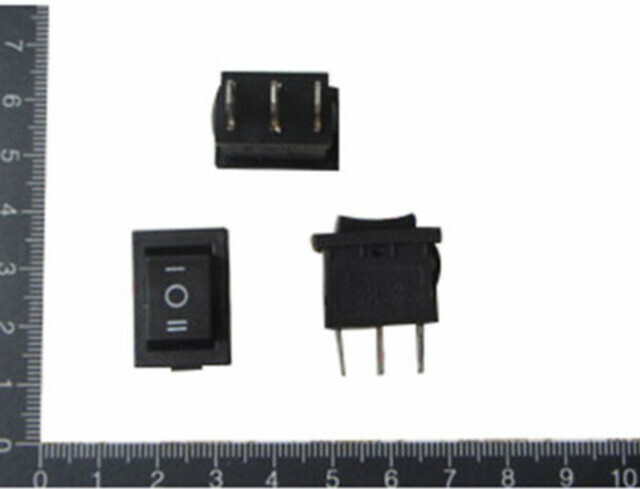 Each group of three is less than a 1/3 watt circuit. You can see the individual 3 yellow LEDs & 1 black resistor circuits here. Bought in a package of 20 for around $9 at the time, HERE are the 3-way switches needed for adding mood lights. They snap into the same hole as the original white colored 2-way switches. Here is a fixture with all the florescent parts removed. I needed to unsolder the switch from the circuit board to remove the circuit board. Here is an LED converted fixture. I selected the angled surfaces for a good flat surface to bond to, and they aim the light more outward. Note the 3-way switch in the center/off position. Also note the tiny 3-LED mood light circuit on the side. Months later I learned that the adhesive backed strips started peeling off at the ends so I added a dab of clear silicone caulk on the ends as an adhesive which worked out very well.. The caulk is not seen because the pictures were taken prior. 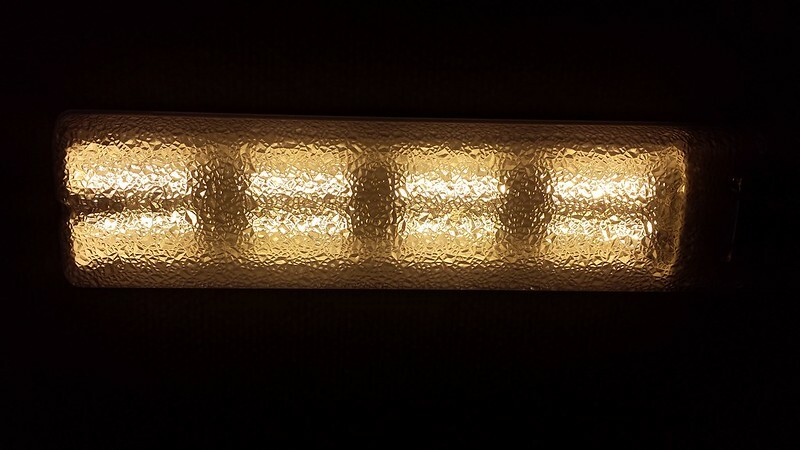 Here is a fully lit 6 watt LED fixture. It was way too bright, lighting the interior of the rig so much that it hurt our eyes, but READ ON. For most fixtures inside, I reduced the light intensity by disabling every third 3-LED circuit by un-soldering their supporting chip resistors to make a 4.4 watt light fixture. Where less light was needed like in the bedroom area, I disabled every-other 3-LED circuit for a 3.3 watt light fixture which is one third that of the original florescent fixtures. For the fixture over the dinning table, I added a POT (potentiometer) to dim the light as desired. I would not add the POT on every fixture, but it is nice to dim the light over the dining table. Here is the single 3-LED mood light which is roughly 1/3 of a watt. Don't be fooled by this picture. It is so much LESS light than this picture is showing. 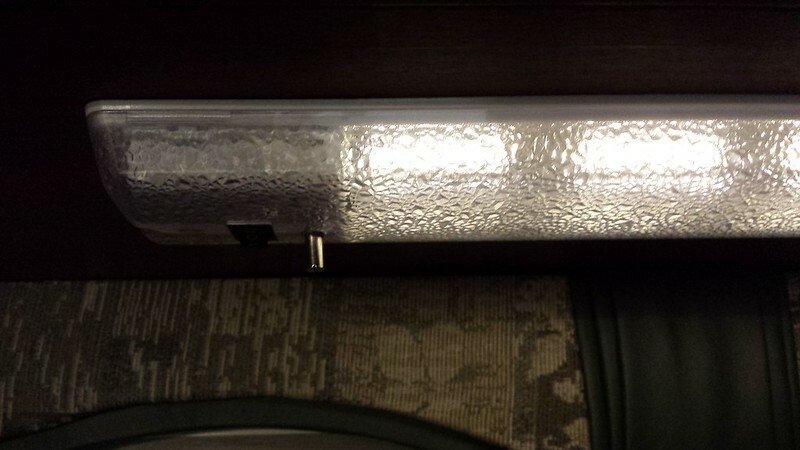 We like to turn on the mood light on every fixture where regular lighting is not needed. Doing so uses so little electricity yet makes our the entire PC very warm and friendly. We don't stumble around in the dark, and often never need to turn on regular lights just to get something. 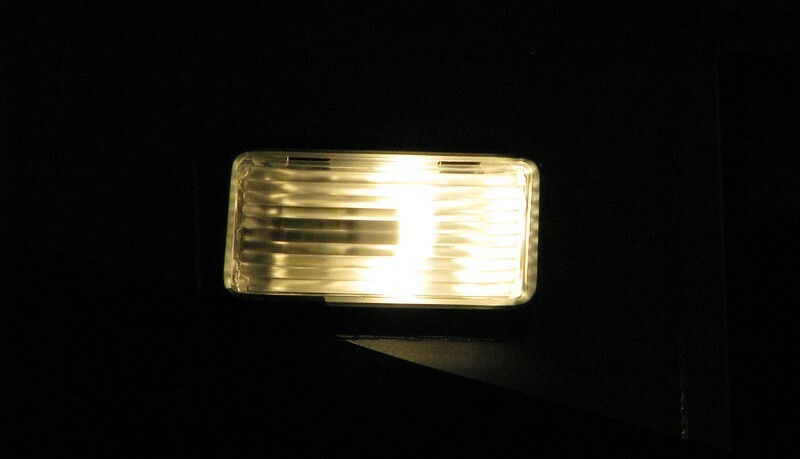 When going to the bathroom in the middle of the night, we turn on the mood light in there instead of the regular light for eye sensitivity, and to keep us from fully waking up. NOTE: Power ratings of each LED arrangement was measured using very expensive electronic lab equipment by a highly skilled electrical engineer. Thank you Jason H. for doing that for me. Another LED conversion to reduce power by 90% was very simple by replacing standard bulbs with equivalent LED bulbs. Unfortunately I don't remember the cost, but it wasn't cheap. I bought 3-twin packs and replaced all my regular bulbs throughout the rig, both inside and outside. I figure it's best to do all in case I accidentally left one on. Here is our porch light with new LED. 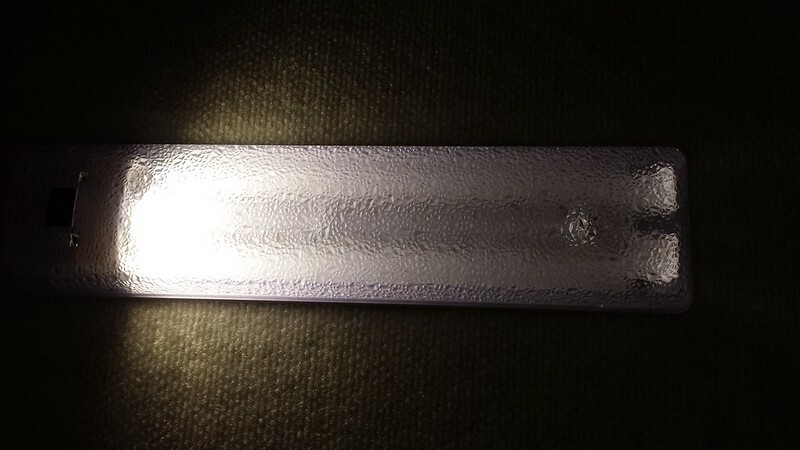 I was able to make it brighter yet by adding aluminum behind the bulb to better reflect the light outward. I did not draw up a wiring diagram, but it is very easy. I don't think you need one when not including a night light. 1) reusing your original switch, solder a wire to the switch and run it outside the fixture to the hot wire (with wire nut) in your PC. 2) solder a wire from the other side of the switch to the "+" connection on each light strip. You can daisy chain them. 3) solder a wire to the "-" side of the two strips and run it outside the fixture to the negative wire (with wire nut) in the PC. When soldering to the switch, consider being consistent with regards to which way the switch turns on, and which way it turns off. Since some fixtures are left-hand and others are right-hand, I made sure the lights go on when toggling toward me, and off when toggling away from me, making them more friendly to operate. It was especially beneficial in my case with the added night-light feature to prevent accidentally flip the switch the wrong way for the desired lighting. Someone recently asked me about my LED conversion so I am bumping it up to the top of Tips & Tricks to make it easier for them to find. I had a lot of trouble finding this post myself for it doesn't show up with my other T&T posts when sorting by author. Great post parts in hand and making upgrades today. Thanks for providing the info. Thanks! I am glad someone else is giving it a try. I advise to first setup one fixture with the 10 individual segments like I used in our bedroom, not the 8 pairs of segments I used elsewhere. Try it in different places throughout your PC. Each PC model will have it's own lighting needs, most influential will be whether you have the light or dark finish cabinetry. Less light saves battery energy. What are the specifics with your PC? Your profile on the left side appears to repeat a zip code or something. Ron, Just finished converting all of my fixtures. Thankyou for your engineering skills and putting together this info. I couldn't find the leds or switches as they were off the market by now. But found what appeared to be similar. I did maybe almost 4 different configurations. All dependent on its location. Example... Bathroom I wanted lots of lighting for the MRS's and a possible night light. Well, the nite light (one string set, of 3 led's) is certainly too much for a night light. So will cut some resistors to fix that. End result... Yes, as you mentioned, a softer, less obtrusive lighting. And.... cannot forget Dry-Camping batteries will love them. Good for you Denny. I am glad it worked out for you two as it did for us. It's nice to know a fellow PC owner has applied one of my ideas into their RV lives. Thanks for sharing that. Thanks for bringing this back. I plan on doing some of this work. Your ideas are great. I just finished this project on my own 2008 2350, and I thought I'd add a few comments to Ron's. First of all, there are a bunch of options for LED's. 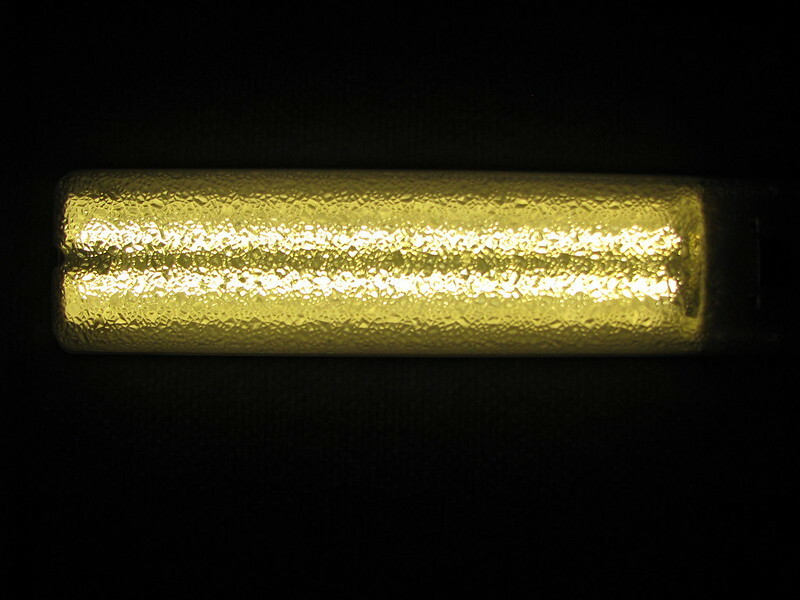 The stock fluorescents are 8w T5 tubes, which are 400 lumens per tube. 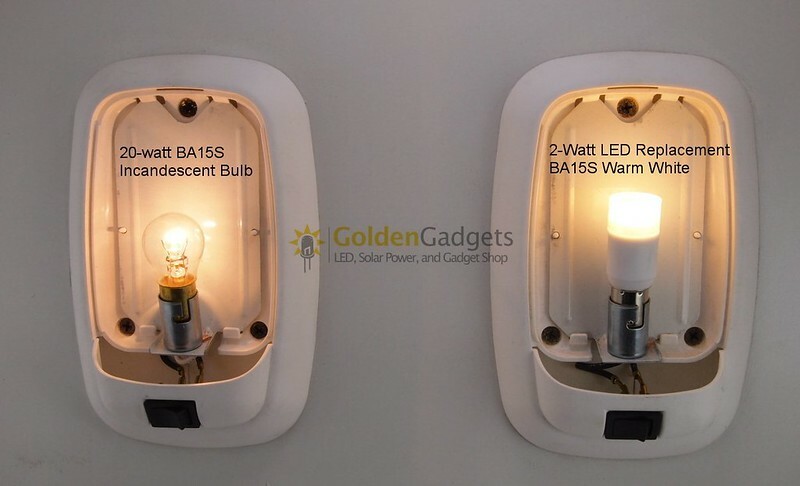 A 60 watt incandescent is 800 lumens, so each stock fixture is the equivalent of one 60 watt light bulb. 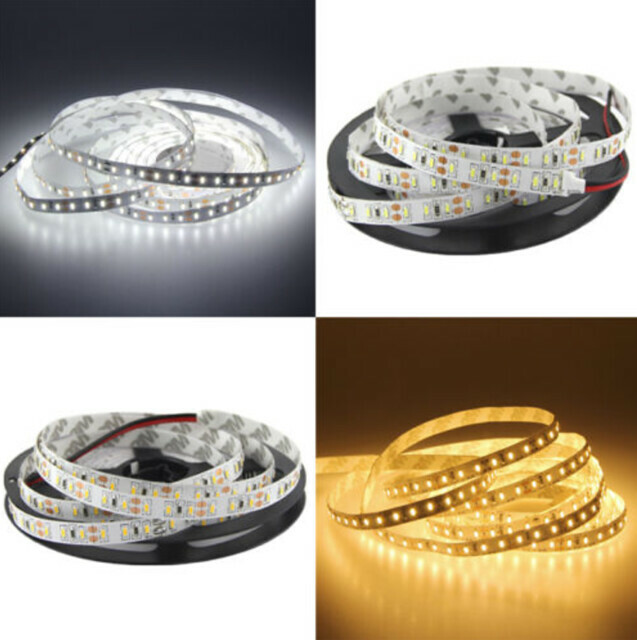 The three most common LED strips use 3528's, 2835's, or 5050's. 3528's only make 8.5 lumens per LED, so you'd need a almost a hundred to equal 800 lumens. Not very practical, but they are probably the most common strips. If you're not careful, that's what you'll wind up with. I settled on 2835's. 30 of them are 870 lumens. That's two 10" strips, which fit perfectly in the fixtures. Thirty 5050's would also work, but a little dimmer, at 720 lumens. You also want to make sure to get "Warm White" (3000K) for the color. Here's some others that aren't waterproof (which we don't need) but I shied away because they said they were only 82 lumens per foot. Probably a miss-print. Unlike Ron, I thought the Cruiser could use a little MORE light, so I also ordered a reel of 3528's and added two of those strips to four of the fixtures, for 1,125 lumens total (equivalent to a 75 watt lightbulb). I put three of them on dimmers and put two in the living room overhead and one in the bath. The one without a dimmer went over the sink. You have to remove them from the plastic box, but the circuit board fits perfectly in the space under the switch, where the original ballast for the florescent was. By the way, the trick to getting the fluorescent ballast circuit board out of the fixture is that the switch is soldered to circuit board. You have to unsolder it before the board will come out. The last thing to consider is what wire to use. The worst case were my four 1125 lumen fixtures. The 2835 LED's are .2 watts per LED and the 3528's .06 watts. That comes to 7.8 watts per fixture. 7.8 watts divided by 12 volts gives .65 amps per fixture. Since 24 gauge stranded is good for 1.6 amps, about anything would work (network cable is 24 gauge), but I had some old 22 gauge RS232 cable, so that's what I used (did I mention I was a computer geek in a previous life?). I guess you could use 18 gauge zip wire if that's what you've got, but it's way overkill and it might be a little big to solder to the strips. 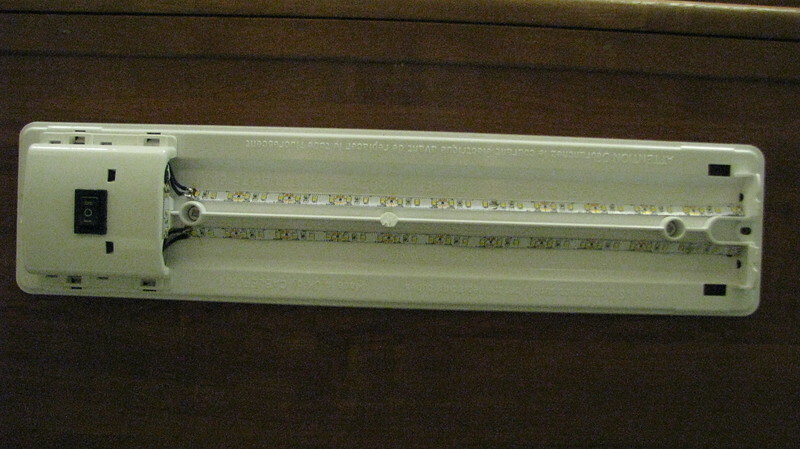 Like Ron, I found the stickum on the LED strips to be not so great and the strips kept coming unstuck. I used some silicon caulk (RTV) like he did. 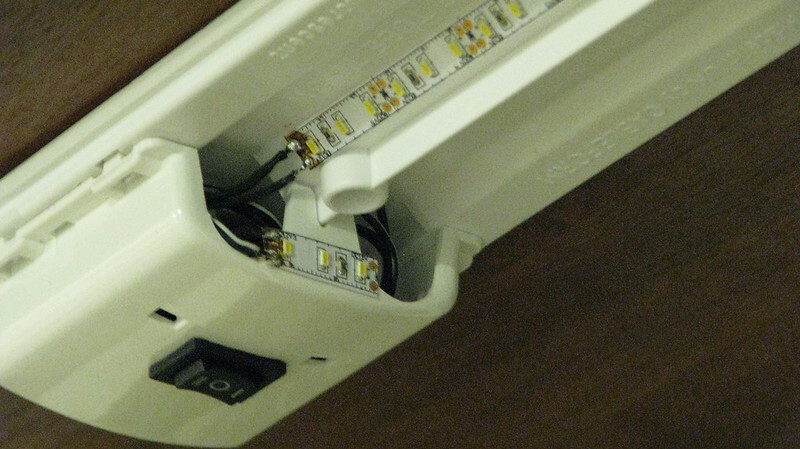 When you connect the fixtures to the RV wiring, on mine, they used white for the negative and some other color like red or yellow on the +12V side, depending on the circuit. Last thing, you might want to test all these fixtures before you re-install them. You've probably got an old 12V A/C adapter from some long forgotten gadget in your garage junk drawer. It will work just fine, and the LED strip even comes with a barrel connector that will probably fit it.